Asfalttikallio Oy is a Finnish company that provides asphalt paving and construction services. Asfalttikallio currently has two Avant 640 loaders in asphalt patching work. Some subcontractors also have their own Avant’s in use at patching job sites and move from site to site throughout the year. Asphalt patching, as many other things, requires expertise, quality materials and the right tools. Asfalttikallio has invested heavily in the development of their own industry. 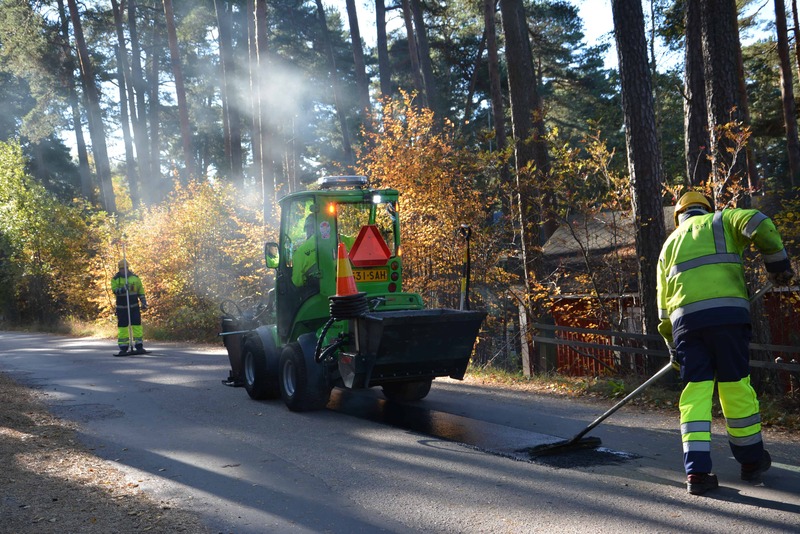 Project Manager Teppo Haapakoski has been developing a safer, more efficient and more economical method for asphalt patching for nearly 20 years, the last four working at Asfalttikallio. On a patching job site Avant is the most important machine: It is the machine doing the patching itself. Once attached to the machine the asphalt spreader uses the Avant’s weight to distribute the asphalt. This is an important factor as the asphalt needs spreading as quickly as possible. The asphalt also needs patching as close as possible to the old surface. “It is important that the patch is tight and long lasting but also thin enough so that there won’t be a large difference between the old and the new surface. We try to prevent the slippery patching track by roughing it immediately after the patch is put on the surface. With Avant both of these jobs are done quickly and with high quality, “says Haapakoski. Haapakoski says that the Avant is a safe, agile and high-quality machine loader. The best part is the patching is always high-quality, regardless if on a straight road or curved. “All the great features of Avant come out particularly well for example when patching is done in traffic circles. Space is limited and the patch has to be curved and Avant can still deliver the same fine quality,” praises Haapakoski. Avant is the right size machine for asphalt patching. It moves fast enough, it’s agile and small enough in size, so that it does not cause unnecessary disturbance to other road users. Asphalt patching is a year round task, so it requires machine durability as well as adaptability to all weather conditions. Transition speed at the site must be safe, yet sufficient. The machine must be capable of complex operations and be agile in many different surroundings. “In this work, Avant is in use throughout the working day. The after sales and service of Avant works extremely well. We’ve developed many great solutions for the machine with the cooperation of Avant manufacturing. It’s great when the same machine is able to handle both patching and roughing the asphalt. I can just say that the loader works, service works, everything works – Avant is the number one for this kind of work,” says Aku Vähäsoini. He has been driving one of the Avants on Asfalttikallio’s patching sites for a couple of years now. Asphalt patching generally uses teams of four on one site. These teams move around Finland with two cars: the tank truck has the asphalt mass and the safety car carries all other goods and the Avant. One big advantage of Avant is its easy transferability. The loader moves with the team, with the same car from place to place and doesn´t need to have separately organized logistics. Asfalttikallio’s operating ideology has many similarities to Avant’s: with minimum equipment and as efficiently as possible – and with high quality. In addition, a beautiful green is the corporate color of both companies. The atmosphere is always positive onsite with everyone working in good spirits. Even a cold breeze can’t remove the smile from their faces. “We’ve got a good bunch of people working for us. It is important for personal chemistry to work well in a team. The operation and service of the machinery is also important. We are lucky to have committed and positive people working for the company,” says Haapakoski. He gives the same feedback for Avant too. Avant Loaders are designed and manufactured by Avant Tecno in Finland. For more information call 1800 686 411 or contact us.